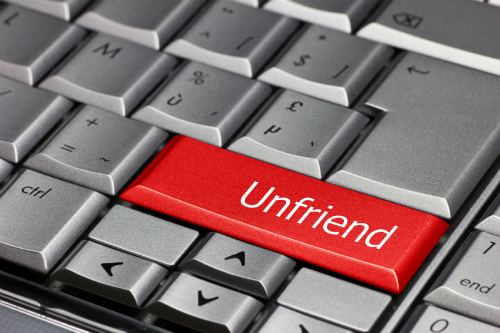 It happens to everyone: After a while, you start to feel like a few people are cluttering up Facebook for you and want to unfriend some. Maybe you just feel like you have too many friends, or maybe you and a friend have legitimately drifted apart. Maybe you had a big falling-out and just need a break. Don’t worry; you can unfriend just like you friend people. Go to the person’s Timeline. A menu appears that is for assigning people to Friend Lists. The last item in this list is Unfriend. A window pops up asking if you’re sure you want to remove this friend. Click the Remove from Friends button. Take a moment of silence. Okay, that was long enough. People aren’t notified when you unfriend them, but people who care about you (that is, family, close friends) have a tendency to notice on their own that, hey, you’re not in their list of friends anymore. This can sometimes lead to awkwardness, so it might be worth using your privacy settings to further limit these people’s knowledge of your life before you unfriend them. Lots of people go through periodic friend-cleaning. For example, after changing jobs or moving, you may notice that you want to keep in touch with some people from that chapter in your life; others, you just don’t. Unfriend away.